Heat your dutch oven over medium high heat. Add the olive oil, then add the carrots, celery, onions, garlic, salt and pepper. Cook until the vegetables are softened, about 10 minutes, stirring occasionally. Add in the chicken drumsticks and chicken stock. Simmer until the chicken has an internal temperature of 165ºF, about 30 minutes. 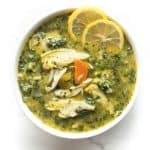 Return the shredded chicken to the soup along with the frozen artichoke hearts, frozen spinach and frozen cauliflower rice. Cook another 5 minutes until the frozen vegetables are thawed and warm. Add in the lemon zest and lemon juice. Taste for salt, pepper and lemon juice and adjust if needed. Serve warm, with additional lemon wedges. Will keep in an airtight container refrigerated for 5 days, or frozen for 6 months. Meal Prep Instructions: Store in an airtight container for up to 5 days in the refrigerator. HEATING: Microwave until warm, about 3-5 minutes. Or reheat in a sauce pan on the stove top until warm. Use of Chicken: I like to use chicken drumsticks because the dark meat adds tons of flavor, and so do the chicken bones when simmering in the soup. But you could substitute chicken breasts or thighs, or even already cooked shredded chicken to cut the cooking time way down!